Anhydrous ammonia is free of water. In this form, it exists as a compressed gas or liquid. Ammonium nitrate exists as a solid. It is the form of ammonia used as a fertilizer. Manufacturers supply ammonium nitrate in bulk containers or bags. Mixing ammonia with water produces two types of ammonia solution. A concentration of 35 to 50 percent is a clear colorless liquid. A concentration between 10 and 35 percent is a colorless aqueous liquid. A clearly identifiable characteristic of ammonia is its strong, pungent odor. What are the Applications for Ammonia? Compressed anhydrous ammonia is very cold. Companies use it as a refrigerant in large industrial applications as well as smaller cold rooms. Ammonium nitrate is primarily used as a fertilizer. The scale of agricultural production makes this an important product with a high consumer demand. The International Fertilizer Association forecast a worldwide demand of 200 million tons of ammonia in 2018. 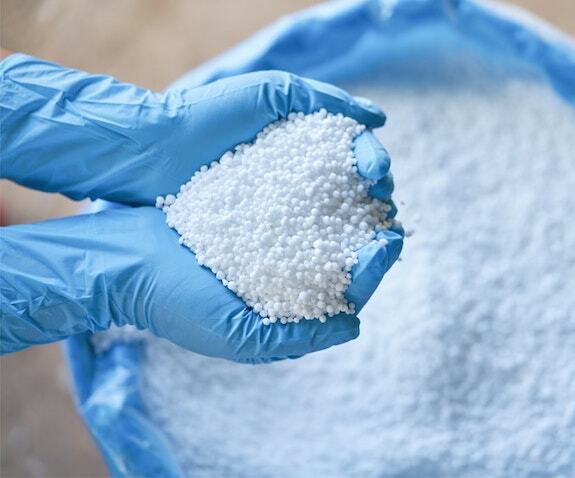 Industrial applications use ammonium solutions. They are also found in many cleaning solutions. Commercial cleaning companies use large quantities of ammonia containing products. What are the Hazards of Ammonia? Although ammonia gas is lighter than air, these vapors tend to hug the surface of the ground. They travel away from the source of a leak at ground level. Ammonia forms an explosive mixture with air. This was the case of an ammonia-related explosion at a fertilizer facility in Texas. Hundreds of people suffered injuries in the 2013 incident and 15 people lost their lives. Ammonia vapors are also very corrosive. They cause severe skin burns and damage to eyes. Ammonia is toxic if inhaled or ingested. Immediate medical treatment is essential after exposure to ammonia. How Should You Store Ammonia? Due to its explosion risk, store ammonia in a fire-rated chemical storage building. Regulators may require this depending on how far the ammonia storage location is from an occupied building. Use an ammonia gas detector in the building to pick up the release of ammonia vapors. This will identify a leak and notify the relevant people via an alarm. Early detection enables a safe and timely response to resolve the leak. You may need ventilation on an ammonia storage building. Mechanical ventilation reduces the concentration of vapors in the building. This lowers the risk of explosion and gives emergency responders safe access to the storage containers. Use hazardous waste storage buildings when dealing with waste containing ammonia residue. Hazmat storage buildings have the same safety features as chemical storage buildings. They are explosion proof and can be fire-rated depending on the needs. Add safety features like mechanical ventilation or climate control systems. When storing ammonia nitrate for use as fertilizer, consider a non-fire rated TURFloc chemical storage building. Be sure the building is located 30 feet or more from an occupied building or property line. Contact U.S. Chemical Storage to learn more about of ammonia storage. Our expert team understand the hazards involved and the regulatory requirements.